Take it easy Adjust the straps to their maximum length. It makes the fitting much easier. Lean in Lean forward into the cups. Your breasts in the cups; the straps are on your shoulders. Hook up Close the bra at your back. Everything in the right place Slip your hand into the cup and lift your breast into the right position in the cup. Shake it! Bend over, hold the bra at the sides and shake your breasts into the perfect position. 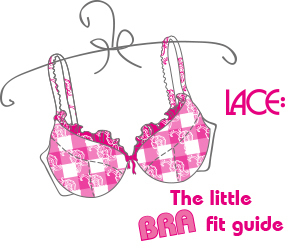 The true role of the straps Now adjust the straps but keep in mind: The straps should sit comfortable on your shoulders, as the back band is having the key role and should carry 80% of your breasts' weight.